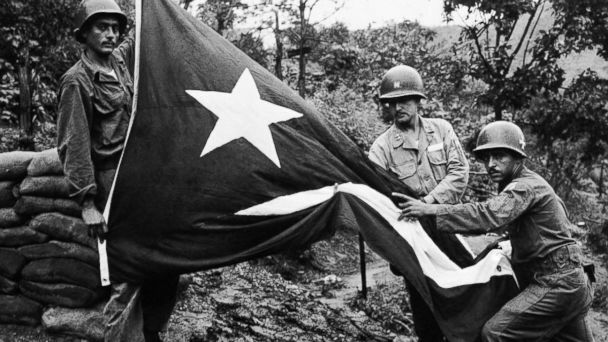 On this Memorial Day, we honor the Borinqueneers. The 65th Infantry Regiment was composed entirely of Army soldiers from the island of Puerto Rico. For this reason they called themselves…the Borinqueneers. During the Korean War, the Borinqueneers were awarded 10 Distinguished Service Crosses, 256 Silver Stars, 606 Bronze Stars, and 2,771 Purple Hearts. The names of those killed in combat are inscribed in El Monumento de la Recordación (Monument of Remembrance), in front of the Capitol Building in San Juan, Puerto Rico. Puerto Rico also honored the Borinqueneers by naming one of its principal avenues in San Juan as La 65 de Infantería. That very flag, which they hold up with such touching pride, was made illegal by Law 53. They could go to jail for 10 years, just for owning one. These young men had to go to war, and risk their lives, to find a place where they could open their flag…even if it had bullet holes in it. They fought bravely…suffered in silence…and today we honor them. It’s incredible how you can die for one flag and you could get ten years in jail for another flag. That’s a hard one to swallow. My Dad Raul Maldonado was one of them! My heroe! Proud of you. The 65th Infantry Regiment …. the Puerto Rican flag flies overseas, in in one of the many American wars!